In case you’re looking for a good visual to show how bike lanes can be extremely efficient transportation infrastructure, check out this short video from the UK-based advocacy group Sustrans. It shows rush hour on the Blackfriars Bridge “cycle superhighway” in London on a Tuesday morning. London has been building out a network of “cycle superhighways” since 2008, but only in the last couple of years has the city started to emphasize physical protection from motor vehicle traffic in its bikeway designs. Here’s a look at what the Blackfriars Bridge bike lane looked like before a recent upgrade. Bicycling in London has risen dramatically in recent years, with bikes now accounting for about a fifth as many trips per day as the Tube, according to Transport for London. In addition to better bikeways, policies like congestion pricing and slow speed zones have made the city’s streets safer and more appealing for people to get around by bike. Nope. More bikes mean more congestion. Just look at all that stopped motor vehicle traffic! Better yet, count the number of bikes and then cars traveling over the bridge in the same amount of time and ask yourself which part of the bridge is doing a better job of moving people. 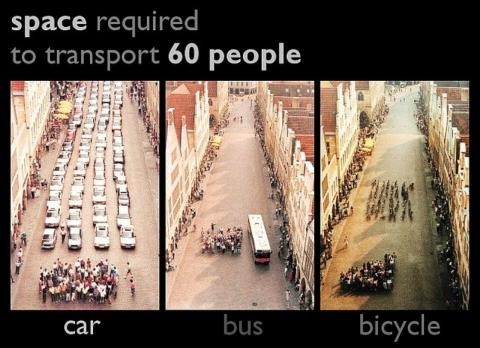 60 cars = 1 bike ! I think you 60 bikes is the geometric equivalent of 1 car. That picture puts it closer to 60 bikes being similar to 4 cars, I’d say. But your point stands, it is a geometry problem. whoa so like if we all cycled instead of drove huge SUVs there’d be Like totally no congestion – Awesome dude ! There are far more bikes passing by in that space than the number of cars that could fit there if it wasn’t a bikeway instead, probably by a factor of 10. Are you all to young to remember the comical stories media relayed abouth the traffic jams in China? .could this happen here? And so true! Having commuted by bike for 20 years, I have seen the change in bike traffic. I think we have all ridden to a big intersection like Grand/Milwaukee and there are groups of riders waiting at a light. Very exciting but there is the occasional bike weaving into another – it is tight at times! Why do so many of them wear neon? Is that a thing in the UK too? Unfortunately yes… the cycle lanes shown are only on a small percentage of roads so a lot of cyclists are dressed like the guys digging a hole to the right of the picture. Hopefully with an expanded network there will be more people not dressed like a construction worker. It’s because in the unfortunate event of being run over by a driver who is distracted while posting to Facebook, some shyster lawyer will undoubtedly attempt to blame it on the cyclist for not wearing hi-viz clothing. The reason is more prosaic. London is much further north – almost as far north as Edmonton, Canada. It is often raining, cloudy or foggy, and with much less sun that is typical in the US. In winter it can be dark for up to 18 hours a day. So all manner of people in the UK wear high-vis outer-wear, such as cops, road workers and anyone else whose safety depends on being easily and clearly seen. Why wouldn’t you want to be seen?